Come to a land of mystique, intrigue and strange tales. Once there was a princess Kanya Devi who was believed to be the incarnation of the Indian Goddess Parvati. She was to marry her consort Shiva but he never turned up on the wedding day. So all the rice and other cereals were left uncooked and gradually turned into stones. Till today, this princess is waiting for her prince to come and marry her. This is the story of Kanyakumari, the presiding deity of the temple at Kanyakumari in the southernmost tip of India. Also known as Cape Comorin, this interesting historical tourist attraction is a perfect place to visit for those who want to see the best of nature in play. With the converging point of the three big water bodies, the Arabian Sea, The Bay of Bengal and the Indian Ocean, being at Kanyakumari, the place is believed to be blessed with inherent heritage, and Mother Nature. 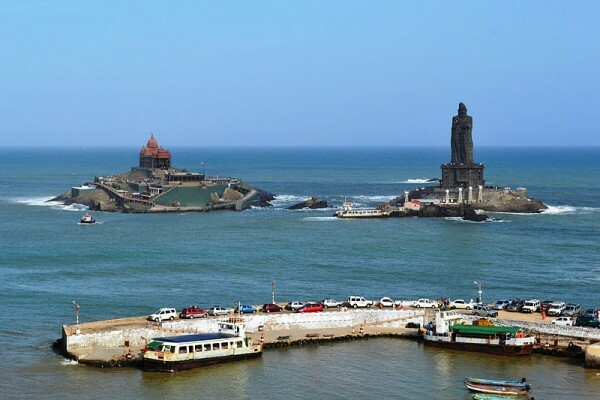 With a rich heritage and legendary history, Kanyakumari the city of 1000 years is today a major tourist hub with people of all religions coming here. Renamed as Cape Comorin by the British, this place has the best temples, beautiful churches and vibrant pillars having the capacity to resound with different notes. This city which was a great centre of fishery in olden days is today a tourist spot and has got its name from the presiding deity Kanyakumari. Accessible by bus from nearby cities, by bus, the auto rickshaw and the rented motorbikes are the common mode of transport here. A tour to Kanyakumari would take you to the Vivekananda Rock Memorial, where Swami Vivekananda is believed to have meditated, the Padmanabhapuram Palace, the statue of the great poet Thiruvalluvar, and the Gandhi Mandapam. The Kumari Amman temple is devoted to the Indian Goddess Parvati and is referred to as the Devi Kanya here . It is a very important temple in Kanyakumari. Then you have the Bhagavati temple which is actually located on the point of meeting of the three huge water bodies of India. It was actually constructed by the Pandyas and then the Nayaks brought it to what it is today. The calm, and tranquil statue of Kanyakumari stands there and it is a very enthralling experience. There is a gate here on the eastern side of the temple and it is open to public only five times in the whole year. The Swami Vivekanananda Rock Memorial is a major tourist attraction. It is believed that this is where Swami Vivekananda, meditated after swimming to this rock in the year 1892. Here is where he decided to serve the country. Gandhi Mandapam is the place where the ashes of Mahatma Gandhi was kept in an urn for the public and then immersed. Strangely on the day of his birthday, it is intriguing to see how the sun ray’s fall on the same place the pot of urn was kept. Vattakottai fort is another interesting place to visit. So go and meet the damsel in waiting in this lovely land called Kanyakumari.